Pure IP TV is here, absolutely, certainly, definitively. 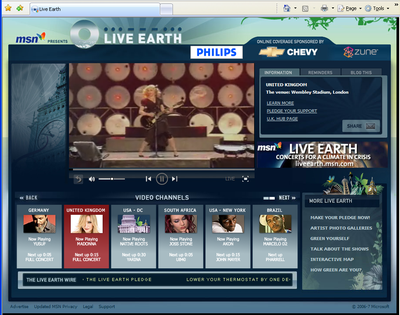 I'm watching the Live Earth concerts from around the world on my computer (2*24" monitors). I learned about the event on the web (on Twitter from all places), not on traditionnal printed media nor TV / radio. And I tuned into this global event online. Did I check whether any of my local TV channels were carrying it ? Nope... Direct to the web : google://live+earth and found the site. It even brings interactivity enabling me to switch from one "channel" to another one. From Brazil, to DC, to China, to Hamburg, to Japan, to London. Content wise, it"s "just" Madonna in Wembley. Awesome entertainment. Live on IP TV. No clue who is providing the CDN and streaming technology this time, but it's WORKIIIIIIIIIIIING ! at last. Huge congratulations to MSN for doing it right. Live 8 on AOL had their own issues last time. My guess is that Al Gore should win the Nobel Peace Prize in the next 5 years with his relentless fight. I published my own video of this talk the other day. Here's a much much better edited version of it. It's totally amazing content. "Brian Cox is Physicist at University of Manchester / CERN. He presents about "CERN's 27km Big Bang machine" at the LIFT07 conference in Geneva, Switzerland, on Friday, February 9, 2007"
…the first free online mag about Tennis in French. You can download the whole issue in PDF, and read the blog at www.grandchelem.net. And a final nightly post for all mathematics aficionados out there. Here’s a wonderful site (you can tell the guy never went to art school or studied web design) about the Fibonacci numbers and the golden section. My friend Fred. H. will appreciate certainly. And here’s a link to another similar theme you should explore. We had tonight the first meeting of the Advisory Board of EPITECH, a French Computer Science school, sister company of one of EPITA, the engineering school I attended over 10 years ago. EPITECH had an interesting approch: it aims to create vocational training, exclusively on IT, in a 5 year program. There is a very strong focus on hands-on learning, with 140 projects to be completed by every student in the course of the 5 years program. As early as the 3rd year, students are requested to work part-time at corporations, and complete 2 full 6-month internships as well. From what I saw tonight, the ambiton is pretty impressive for a school created only 5 years ago. Last promotion saw 135 students receive their degree, with 100% of them finding a job in less than 3 month (75% get hired before graduation). Average salary is near 32K€ at graduation time. I am joined at this Board by about 12 people, from Apple, Wanadoo, Nagra, Sophos, Accor, etc. It should be very interesting and I am honoured to contribute to the steering of the learning of these young graduates. I'll update this post with pictures shortly. I seldom get the impression of reading the same book again. Even weirder when you read the 'sequel' before the current book. 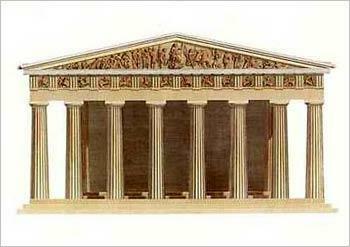 the plot deals with an -again- obscure brotherhood from medieval times (the Illuminati - traces all over the web...), trying to destroy the Vatican -again-; followers of the brotherhood are very well connected (read infiltrated into the upper ranks of society), with links to the Masons, and almost brain-washed followers. Both brotherhoods use expert killers, and descriptions of both brotherhoods are said to be factual in the preface. I am sure these stories are going to make great action/suspense fiction films. I understand from the web that the Da Vinci Code is already being planned; the books have a fantastic kind of ambiance, such as those found in the great 'Silence of the Lambs' or the less good but still interesting 'Seven'. Has anyone read both books ?